Kreimer’s Bier Haus server Braydon Hayes still doesn’t know how the January fire that charred his family’s small restaurant started, but he knows what it’s meant for its dozens of employees: Nearly three full months of uncertainty and financial stress. Bartenders and waiters who went to sleep with a reliable source of income Jan. 15 woke up Jan. 16 without one — or any idea when the restaurant would be able to reopen. Whitewater Crossing Christian Church decided to spend the Lenten season helping fill the gap. 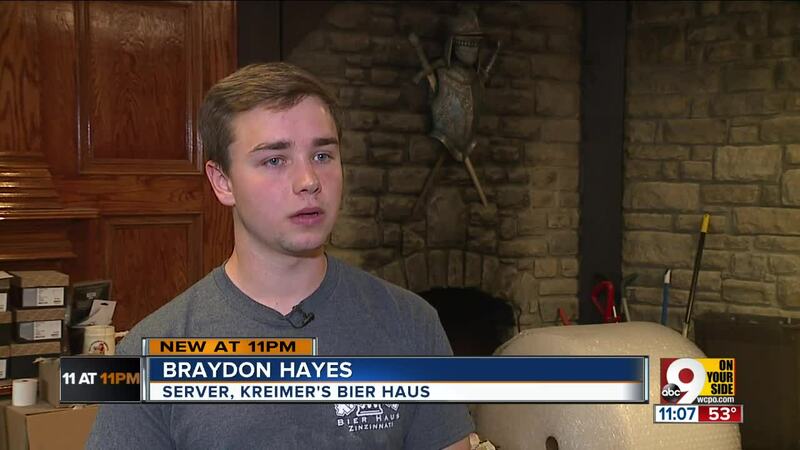 CLEVES, Ohio — Kreimer’s Bier Haus server Braydon Hayes still doesn’t know how the January fire that charred his family’s small restaurant started, but he knows what it’s meant for its dozens of employees: Nearly three full months of uncertainty and financial stress. Bartenders and waiters who went to sleep with a reliable source of income Jan. 15 woke up Jan. 16 without one — or any idea when the restaurant would be able to reopen. Whitewater Crossing Christian Church decided to spend the Lenten season helping fill the gap. “We began to talk as a church, and we were saying, ‘How can we help out in this time?’” said Jess Adkins, the church’s executive minister of ministries. The answer: By donating all of the proceeds from its popular Friday evening fish fries to the workers whose financial security had been scrambled by the fire. At $12 for an adult meal and an estimated 500 meals served each Friday, it’s a considerable sum. “They talked about doing one or two (weeks), and we said, ‘Why don’t we just do it, the whole thing, for eight weeks?’” Adkins said. Hayes, who considers the restaurant a second home, hopes it will make enough of a difference to ensure Bier Haus’s workers can return when it reopens near the end of May.